Analog Artist Digital World: A Live Urban Sketch Class at DRIP. 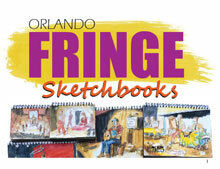 I offered a Live Urban Sketch Class at DRIP (8747 International Dr #102, Orlando, FL). You enter DRIP from a loading dock giving the venue a mysterious speakeasy vibe. My eyes had to adjust to the dark black light interior. I was running about 15 minutes late thanks to rush hour traffic. 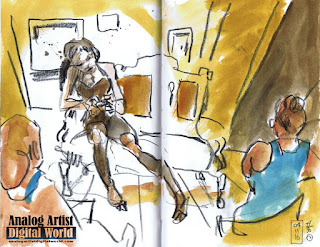 There were close to a dozen artists in the bar area. A volunteer agreed to model. She was tall and chiseled with beautiful dreadlocks. We discussed basic human proportions which I break down into four units. Half way between the head and feet is the waist. Half way between the waist and the feet are the knees, and half way between the head and the waist is the heart. I discussed how your eye line should relate to the figure and I had everyone draw this line on the page. We did five minute poses and each time I asked student to make each drawing smaller than the last, while keeping one aspect of the models body lined up with the eye line. The result was receding figures that looked like they could be standing on the same floor plane. 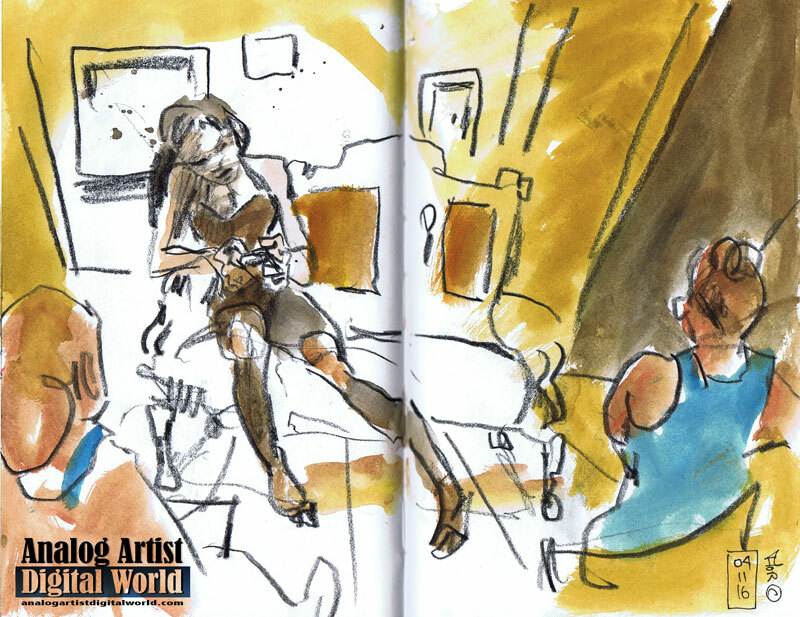 We then moved to longer poses where the model sat on the couch and looked at her iPhone. I encouraged everyone to include background elements. Our model had to leave, so Jessie Sander, a DRIP dancer, took over. She offered the class plenty of action lines and gestures to work with. I came up with a new exercise in which everyone broke up the page into four panels to create thumbnail or storyboard sized panels. 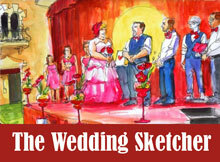 I had everyone just draw the background, or staging elements. They were encouraged to find interesting new angles for each sketch. Then Jessie returned to the set, and students added her to the scenes. Some really fun work came out of the exercise. 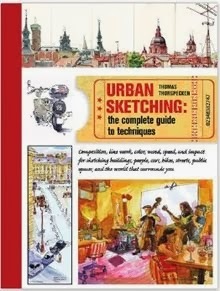 I plan to recreate the exercise for my younger Urban Sketch students today. 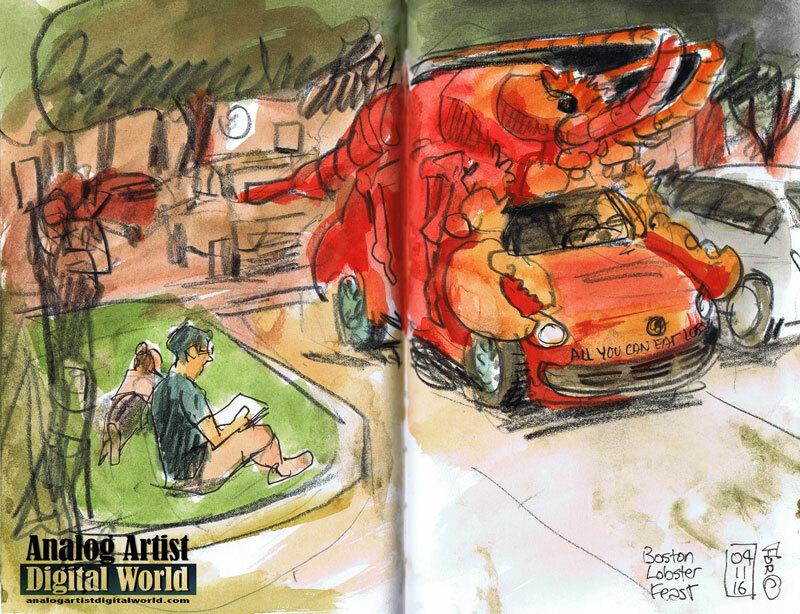 Finally, we went on a field trip to the parking lot next door, to sketch The Boston Lobster Feast car. It is a tiny red beetle that has a huge mean looking lobster on top of it. Anytime people entered the restaurant, the sweet buttery smell wafted outside. Every tourist walking down International Drive has to stop to take a photo of the huge lobster. 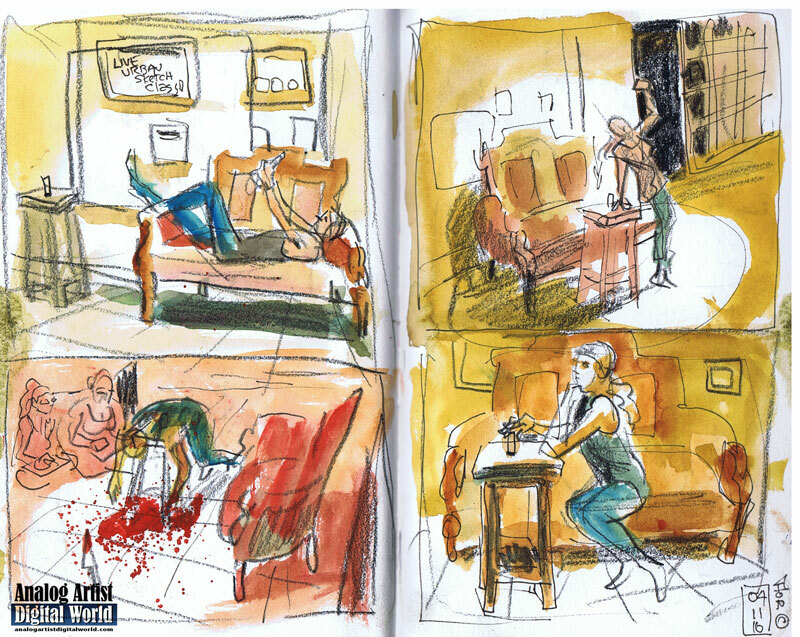 The artists scattered around the monster and began to sketch. 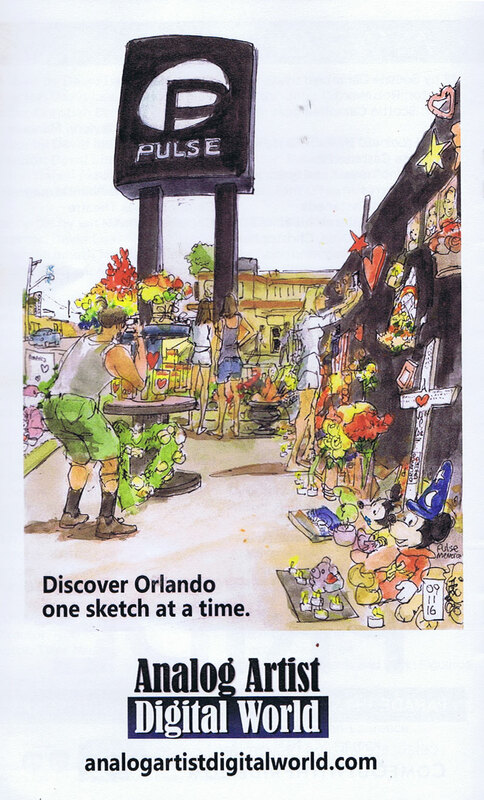 Some tourists were curious about what we were up to, so it was a good initiation for beginning artists to realize that no one ever judges your work when sketching on location. 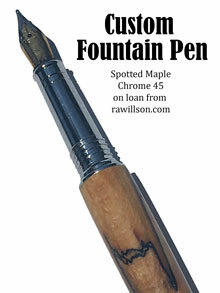 I was pleased that one artist was asked, "Are you an artist?" I'm always tempted to come up with a snarky remark, but end up responding, "Yes." Overall, I had fun giving the workshop and it would be fun to repeat. Jessica Mariko, DRIP's founder suggested having the model under a sand shower or paint can chandelier while artists sketch. 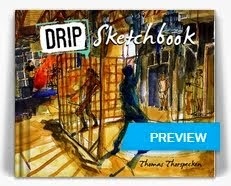 The possibilities for fun, wet, spontaneous sketch opportunities is endless.